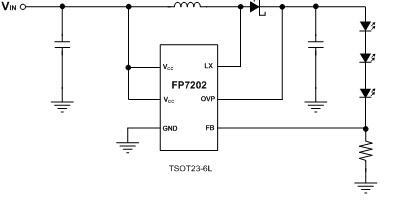 The FP7202 is a Boost DC-DC converter specifically designed to drive white LEDs with constant current. The device can support 2 to 7 white LEDs for backlighting and camera flashing. This high efficient regulator and internal compensation network minimizes as 5 external component counts. Optimized operation frequency can meet the requirement of small LC filters value and low operation current with high efficiency. The non-inverting input of error amplifier connects to a 0.25V precision reference voltage and internal soft-start function can reduce the inrush current. The FP7202 is available in the TSOT23-6L package and provides space-saving PCB for diverse application fields.